This essay builds upon those critiques by arguing that Huntington’s theory, if taken seriously, should imply a U.S. focus not on the Middle East, but on Asia. After all, Huntington believed that conflict was most likely to emerge between civilizations, and the greatest confluence of civilizations (as Huntington defined them) occurs in Asia. Thus I focus not on whether Huntington provides a useful guide for policymakers, but on whether supporters of the Clash of Civilizations have overlooked its implications for security risks in Asia. 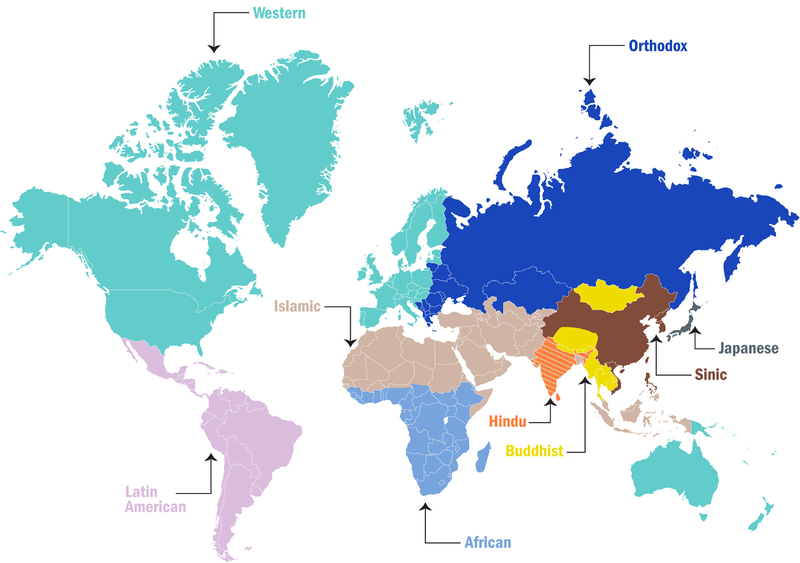 In his 1993 article, Huntington suggested, “the principal conflicts of global politics will occur between nations and groups of different civilizations… The fault lines between civilizations will be the battle lines of the future.” Huntington separated civilizations by their cultural identity, which he described as including “common objective elements, such as language, history, religion, customs, institutions, and by the subjective self-identification of people.” Huntington then identified up to nine separate civilizations across the globe. Although many of Huntington’s readers have focused on the clash between “Western” and “Islamic” civilizations, his underlying theory suggests that conflict might be more likely in Asia than the Middle East. After all, Asia includes seven of Huntington’s nine civilizations, whereas the Middle East was described as largely united under an Islamic civilization. In Asia, however, Huntington saw multiple civilizations locked in competition, including the Western civilization (in Australia), Islamic civilization (in Indonesia), Confucian/Sinic civilization (in China), Hindu civilization (in India), Buddhist civilization (in Thailand), Japanese civilization (in Japan), and Slavic-Orthodox civilization (in Russia). Numerous countries in Asia also exhibit aspects of multiple civilizations and therefore represent “cleft” countries, according to Huntington. If one follows Huntington’s theory to its logical end, then one might expect a far-reaching clash of civilizations to occur in Asia. Emma Ashford concludes that “Trump’s administration appears to bring U.S. foreign policy another step closer to embracing a Huntingtonian view of the world.” If Ashford is right, might the Trump administration be forced to refocus on Asia? The George W. Bush and Barack Obama administrations both began their tenures with dreams of turning U.S. attention to the Asia-Pacific region. The Bush administration started with senior leaders determined to focus on great power competition, particularly the rise of China. As Nina Silove has recently documented, U.S. defense officials launched a Defense Strategy Review that was intended to initiate a “long-term shift in focus” toward Asia. Yet the events of September 11, 2001 forced the Bush administration to reorient its strategy. The subsequent U.S. engagements in Afghanistan, Iraq, and elsewhere distracted the Bush administration from its original focus on Asia. The Obama administration also sought to focus on Asia. While seeking to draw down U.S. combat forces in the Middle East, Obama stated that the United States had “made a deliberate and strategic decision” to turn its “attention to the vast potential of the Asia-Pacific region.” Secretary of State Hillary Clinton described the coming years as “America’s Pacific Century.” Assistant Secretary of State Kurt Campbell argued that history would “be largely written in the Asia Pacific,” but that Asia “had not been accorded a policy prominence commensurate with its true importance.” Yet the Obama administration was also eventually pulled back toward the Middle East. These experiences suggest that although the two previous administrations largely rejected Samuel Huntington’s premise of conflict with Islam, they could not escape underlying tensions in the Middle East. Might the reverse happen in the Trump administration? Could the tensions that Huntington described in Asia force the Trump administration to turn its gaze west? Some early administration officials appeared to embrace Huntington’s thesis and see a civilizational struggle emerging. For example, in a book focused on “radical Islam,” recently departed National Security Advisor Michael Flynn wrote (with Michael Ledeen), “I don’t believe all cultures are morally equivalent, and I think the West, and especially America, is far more civilized, far more ethical and moral, than the system our main enemies want to impose on us.” Yet, as the Bush and Obama administrations learned, U.S. global responsibilities can quickly force leaders to reallocate time, attention, and resources. Although some may want to focus on Huntington’s expected clash between “Western” and “Islamic” civilizations, others in the administration might be pulled back toward Asia. After all, Asia is home to a larger set of neighboring civilizations and the tensions that come along with those interactions. It is important that critics discuss the theoretical, empirical, and ethical issues with Huntington’s Clash of Civilizations. But those that embrace his work should beware not only the clash of civilizations in the Middle East, but also the return of history in Asia. Samuel P. Huntington, The Clash of Civilizations and the Remaking of World Order, Simon & Schuster (New York: Simon & Schuster, 1996). Samuel Huntington, “The Clash of Civilizations?” Foreign Affairs (Summer 1993), 41. Huntington, Samuel P. “The Clash of Civilizations?” Foreign Affairs 72, no. 3 (1993). Nina Silove, “The Pivot before the Pivot: U.S. Strategy to Preserve the Power Balance in Asia,” International Security, vol. 40. no. 4. (Spring 2016): 55. Barack Obama, “Remarks by President Obama to the Australian Parliament” (speech, Canberra, November 17, 2011). Kurt M. Campbell, The Pivot: The Future of American Statecraft in Asia (New York, 2016), p. 4. Michael T. Flynn and Michael Ledeen, Field of Fight: How We Can Win the Global War against Radical Islam and Its Allies (New York: Griffin, 2017). For a discussion of some of the major risks to Asian security and prosperity, see Michael R. Auslin, The End of the Asian Century: War, Stagnation, and the Risks to the World’s Most Dynamic Region (New Haven, CT: Yale University Press, 2016).